every woman, getting ready for some solid action, think carefully about your wardrobe, hair and makeup. And if everything is more or less clear with clothes and shadows, the hair takes a lot of energy and requires a good imagination. Let us now learn how to make classic high hairstyle on long and medium hair with his hands. Hairstyle called a ” French shell”, how to do it – see photo-instruction and our article. For, to start working with hair, it is necessary to rinse well, dry and textured. Do not use sprays in the case, makes the hair stiff and lifeless. will have to overpay, but we need light, silky and obedient hair color. We comb your hair and divide them into three equal parts. One strand is folded over his eyes, two strands – left and right of the face. Now well nacheshem strands at the crown, from all sides and from all partings. Check greased back hair and secure them with fixative spray. Take all the hair in one hand and the tips of their nacheshite, So, so that there has been a slight negligence hairstyles. 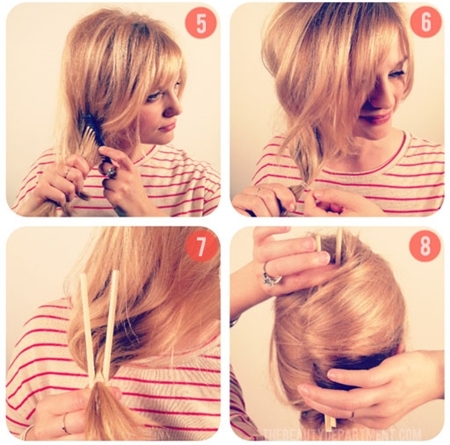 Use invisible elastic band for hair and assemble them side. This is required, the hair gathered in a shell formed on the center of the head. Arm yourself with chopsticks. Grab their hair from both sides of the gum and squeeze. 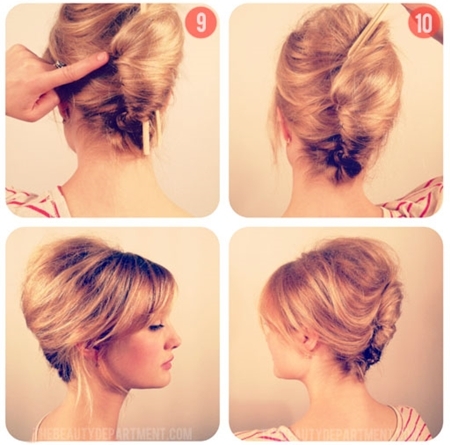 Pick up the hair in the form of shells, fastens the ends to the center. Do not be afraid, If at first you do not get the perfect design. Just shoot forth a shell and try to reel again. After a short training you will get some skill and will very quickly turn to “French shell” before an important event. Complete the creation of high hairstyles for long and medium hair with his hands, turn to lock it. With his left hand hold the hair in the same chopsticks, which was used in the assembly of hair. 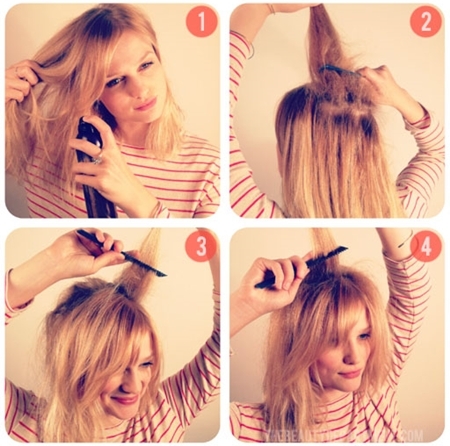 Right hand fix your hair using bobby pins or invisible pins. In fixing this hairstyle is better to use large studs, to capture the maximum amount of hair. When fixing pins hairstyles, follow. to stick, supporting the hair from getting caught between the doors studs. Otherwise you will have to redo everything. When you decide, that hair is securely locked, gently pull the sticks out of the hair and once again the fortress Give hair using hair spray. To decorate the face of the shell can be removed a few curls, coquettish twist of their temples. Like this, with ease, and most importantly – fast, can be built evening hairstyle on long and medium hair with his hands.